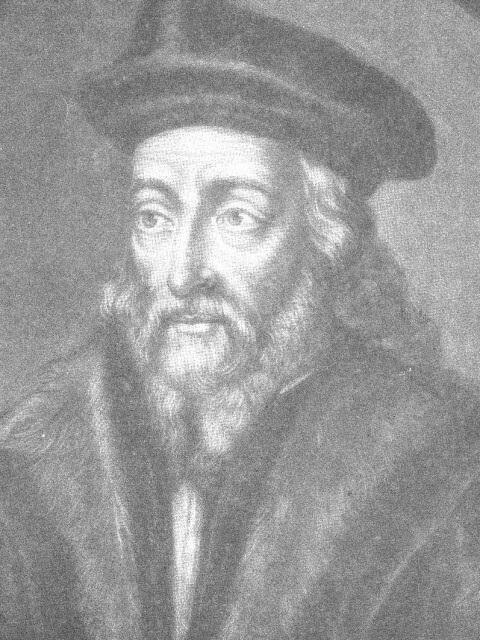 Jan Hus was a Bohemian (Czechoslavakian) priest ordained in 1401, who shared similar views with John Wyckcliffe concerning the excesses of the medieval Catholic Church. said to be 200 volumes finely written, bound in leather and gold bosses. students who resented the actions of the archbishop. 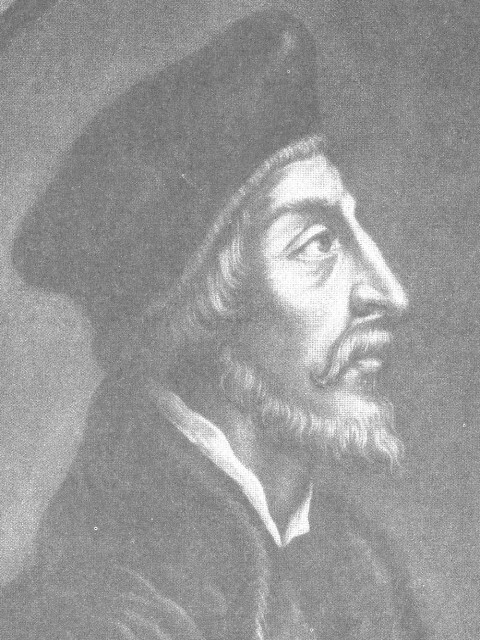 Hus spent most of his career at Prague University and as a preacher in the nearby Bethlehem Chapel. from the states of Bavaria, Saxony and Poland ( most of whom were German). His public speaking emphasised personal piety and purity of life and stressed the role of the Scriptures as the authority for the church. An early publication by him, On the Church, defined the church as the body of Christ with Christ its only head, and taught that only God can forgive sin. These beliefs put him into conflict with the Catholic Church who regarded him and Wyckcliffe as two of the most dangerous heretics in Europe. Underpinning the resentment of the church was that Hus had sought to remove the University of Prague from the jurisdiction of Gregory XII ( one of the Three Popes then disputing amongst themselves who was the genuine Pope). withholding of the wine from the people during Holy Communion. by saying mass, becomes the creator of his creator. That the priests can remit the pain and guilt of sin. That every excommunication, just or unjust, binds the excommunicant. The sixth related to the practice of simony. down pending consideration of the matter (who was the one and true pope). Wyckcliffe. Some eighty nine charges were raised against him but very few indeed were in any wayproven. ( Rolt in Lives of the Principal Reformers says 2 May 1415). The despicable treatment of Hus`s remains serves perhaps to illustrate just how afraid the prelates were of the martyr, his criticisms and his very memory. charges against him, in their determination that he should be executed. Jerome was disgracefully treated, harassed and bound in chains. His accusers, such as they were, made sweeping allegations of errors but could not come up with specific instances nor would they allow Jerome to explain his views without interruption. Soon the cries of heretic broke out and a blood – or burning, lust took over. prison to await his judgment. had died, they stripped him of his clothes, chained and roped him and heaped firewood over him, then set it alight. It is said that Jerome kept singing and praying for many minutes before the roar of the fire drowned his voice out, even then his body and mouth were working for a further fifteen minutes or so. 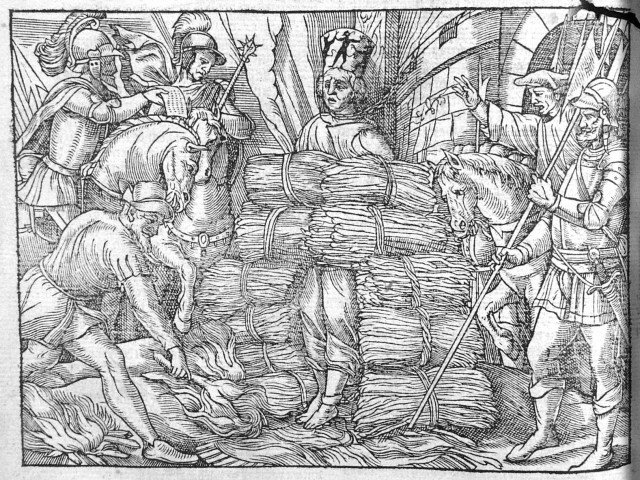 His clothes, boots, bedding from the prison, and his personal papers, were brought and heaped on the fire so that eventually all was burned, and the residual dust cast into the waters of the river Rhine. A consequence of these executions was a protestation by some fifty four nobles to the Council of Constance in defence of Hus and Jerome. The spite and malevolence of the prelates only succeeded in raising national feelings in Czechoslovakia and the establishment of a Hussite Church which survived until ca 1620. Moreover, their executions did not extirpate opposition but served to focus attention of the serious minded throughout Europe to the cruelty, injustice and hypocrisy exercised by the papal authority. The obvious intention became clear – to perpetuate ignorance superstition and, in short, slavery to Rome. Other kingdoms and states occasionally resisted the encroachments of Rome and a momentum was beginning to build for reformation. Actual breaks would soon follow that created new political alliances based on religion. In a short time the contending religions separated out to Denmark, Norway, Sweden, Brandenburgh, Prussia, England, Scotland, Ireland and Holland with Protestant governments. Italy, Spain, Portugal, and the Spanish Belgic states were Catholic. Germany, with its many princes were divided roughly half and half; Switzerland was divided but preponderantly Protestant. And France almost turned, having a large minority firm in the Protestant faith. The catholics were still numerically superior although the Protestants rather weakened their position by the two major divisions – following Martin Luther and Philip Melanchthon or Calvin. Lutheranism largely prevailed in the northern states of Norway, Sweden, Denmark and the German states, while in Britain, Holland, Switzerland and France Protestantism followed Calvinistic lines. The importance to the English Reformation of these alignments was in the strategic alliances to safeguard her borders.